Ashtabula Flats was built on the southeast corner of East Third Street and Fifth Avenue East in 1892 by Ray T. Lewis and Charles R. Haines. A native of Maine, Lewis had been a ship captain and sailed the world on clipper ships. 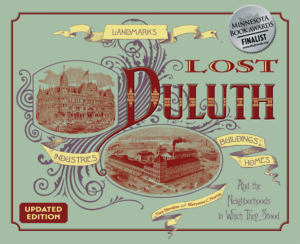 He came to Duluth in 1884, worked in real estate, and served as Duluth mayor from 1894 to 1896. Haines also worked in real estate and served as president of the Lakeside Land Company from 1896 to 1900. Neither Lewis nor Haines ever lived in Ashtabula Flats. Haines and his wife Amanda lived just across Third Street from the Flats at 501 East Third Street. Lewis died in 1912 and Haines left Duluth in 1916 after Amanda’s death. A true Duluth pioneer, Amanda Randall Haines came to Duluth from Philadelphia in 1870 as a young woman, staying with Luther Mendenhall’s family until she married Charles in 1873. 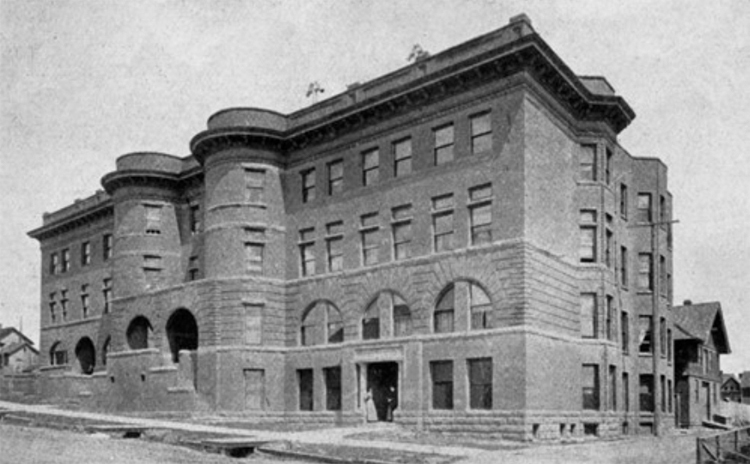 The massive, four-story apartment building in the Romanesque Revival style was made of brick and stone with two rounded half towers on the Fifth Avenue side and rounded stone arches over entrances and some windows. In 1930 there were twelve apartments in the building. It survived until 1987 when it was demolished for an SMDC parking lot.